Multi-line or Paragraph Text objects allow you to create text that spans multiple lines in your BarTender document. 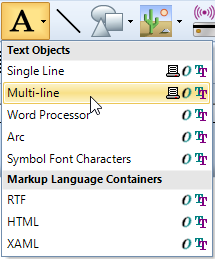 Select the icon on the object toolbar to display a list of all available text object types. Alternatively, select Text from the Create menu. Click the desired location on the template to add the new Multi-line Text object. Right-click on the text object and select Properties from the context menu. On this screen, you can enter data directly into the Embedded Data window. You can see that the text object automatically wrapped the text to a new line to fit the confines of the text box (denoted by the green outline). You can force BarTender to put text on a new line by entering a carriage return into your data or by using the Symbols or Special Characters dialog to insert the <CR> control character. For more information review Paragraph Text in the BarTender help system.